This is a step-by-step walkthrough which will create a new database using C# code. 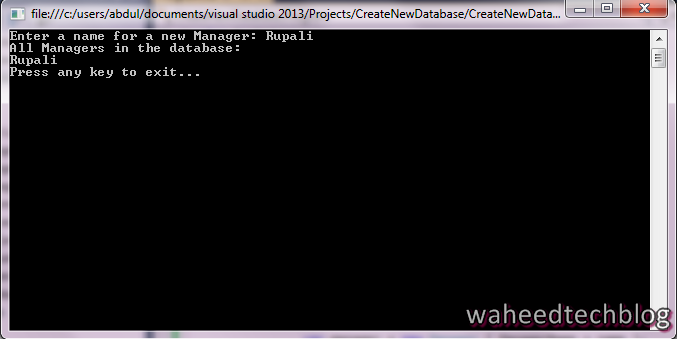 We will create one console Application which will create an empty database and will also add new tables too. Apart from that, You will also need to have NuGet installed on your Visual Studio. Now we will create two simple model(Employee, Manager) using classes. As a part of demo I'll define both in Program.cs but in a real word application we should define in two separate file/classes. Add the following two classes in Program.cs. If you have notice I have made the two navigation properties (Manager.Employee and Employee.Manager) virtual. This enables the Lazy Loading feature of Entity Framework. Lazy Loading means that the contents of these properties will be automatically loaded from the database when you try to access them. Before creating a context, first we will install the EntityFramework Nuget package. Select the online tab and then select the EntityFramework Package and Install. Now we need to create a session so that we can query and save data into the database, we need to define a derived context (System.Data.Entity.DbContext) and exposes a typed DbSet<Entity> for each class in our model. Add following derived context in the the Program.cs file. Now its the time to implement the Main method in Program.cs. It will create a new instance of our context and then uses it to insert a new Manager. 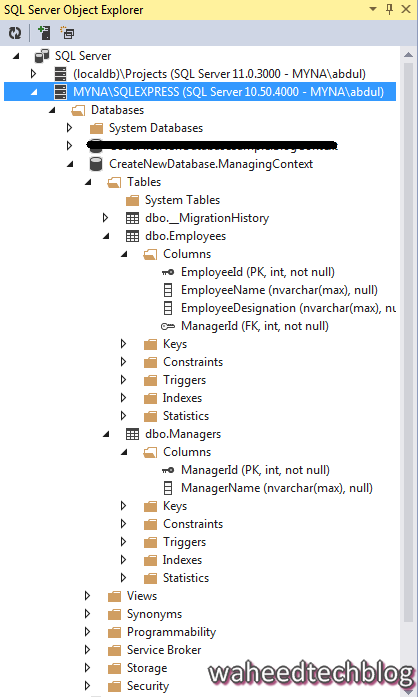 I have used LINQ query to retrieve all Manager entry from the database. 5. Where is your Data ?? DbContext has created a database for you. You need to check it into your SQL Express instance or If you have installed it then it will be in your LocalDb. (Both are installed by default with Visual Studio 2013). Click here if you don't know how to connect to database.